A useful means to improve the technical knowledge of students (and librarians) is to undertake Certification in financial databases, such as Bloomberg, Datastream and Thomson ONE.com. Recently, the certification scheme for Bloomberg, with the official title of ‘Bloomberg Essentials Training Program’ has changed – this revised post highlights these changes. I have successfully undertaken certification for a number of financial databases over the last four years, which has helped me in my role in the Business Data Service. This gave me the authority to be able to stand in front of students in a training session, having gone through the process myself and therefore being in a position to answer any questions relating to certification. This article sets out my experiences and thoughts on database certification, comparing and contrasting some of those available. The certification process involves becoming familiar with content relating to a database. This is represented in a series of videos (Datastream and Thomson ONE.com) and help screens (Bloomberg) on which the examination(s) are based. Upon successful completion of the examination(s), a certificate is emailed to the candidate, which can then be added to their curriculum vitae. A candidate is required to be a current student at the university offering the database, to be covered by the usage licence and therefore entitled to use the product and undertake certification, for which there is no charge. I will consider Bloomberg and Thomson Reuters certification schemes. The certification scheme has changed from 16th July 2015. As such, there is new content, display format (Help pages, rather than videos) and examinations. In order to keep up to date and be in a position to better advise students attending my Bloomberg Certification training courses, I successfully retook the examinations for certification (October 2015) – the changes are detailed below. Help screens are accessed at a Bloomberg terminal using the BESS function. Type BESS on the command line (top left) and press the Enter/Go button. Having to be at a terminal to view the help screens and take examinations limits flexibility. This is because it restricts students to the opening hours of the buildings in which the Bloomberg terminals are located. The Core Program includes: Getting Started with Bloomberg, The Bloomberg Excel Add-In, Bloomberg News and Research Functionality and Bloomberg Launchpad. The Market Sector program includes: Equity Essentials, Fixed Income Essentials, FX Essentials and Commodity Essentials. The screens assume no prior knowledge and develop a user to a moderate level of competence, covering numerous functions. Questions are based on the content within the help screens. There are no sample examination questions. A candidate would need to obtain a Bloomberg Personal Login and use this to log in to Bloomberg prior to taking the examinations. This means the system knows who is taking an examination and their name would appear on the certificate, when examinations have successfully been completed. Obtaining a personal login is a quick process, taking a couple of minutes – which I normally guide students through after a training session or at a later date by arrangement. Examinations are started from the BESS screen. It takes a minimum of two examinations (Core [25 questions, multiple choice] plus one Market Sector, e.g. Equity Essentials [25 questions, multiple choice]) to qualify for a certificate. The Core examination must be taken and passed prior to undertaking a Market Sector examination and the date an examination is attempted is at the student’s discretion. The pass mark is 75% or better and an examination can be retaken once only. Students could of course choose to take more than one market sector examination, for which they would receive further certificates and demonstrate a wider grasp of the Bloomberg Professional service. There is no time limit, but an examination needs to be completed in a single session – it isn’t possible to get part way through and return the next day, as terminals are closed down when a library closes. After successfully completing a Market Sector examination, a dialog box gives a prompt to ‘Request Acknowledgement of Completion’ to confirm the email address to be used for sending the certificate. This is emailed as an image file attachment which can then be printed and/or saved. Certification is currently provided in three areas: Datastream, Thomson ONE.com Investment Banking, and Eikon. Having undertaken the first two, I will deal with these, which follow the same format. 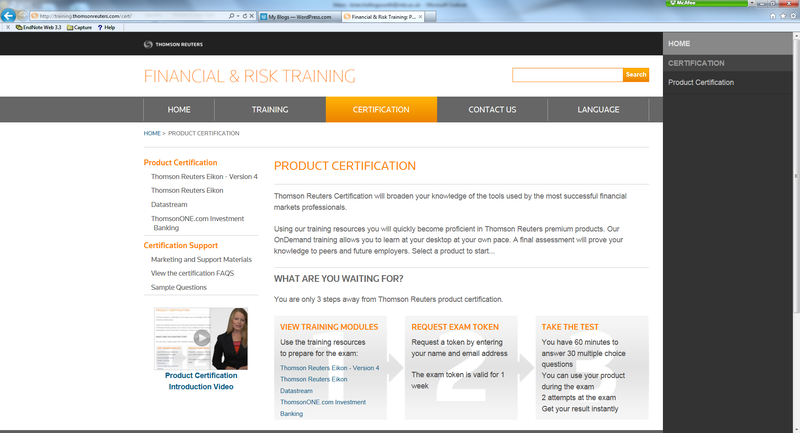 Videos are web-based: at Thomson Reuters Product Certification and it is a quick process to enter name and email address (university) each time when using a public PC, or details can be ‘remembered’ for seamless progression if using a private PC. Having web access adds greatly to flexibility when preparing for examinations as viewing could be off-campus, in a hall of residence or private house, for example, and therefore not limited to library opening hours. Thomson Reuters takes a different approach to the videos, in terms of timing, with narrower topic areas and hence shorter times for each video. Format: screen shots with dialogue boxes and an audio commentary – plug in headphones to the computer base unit. Datastream: Around 130 videos are available, totalling about 6 hours of content. These typically last between one and seven minutes – much shorter than those for Bloomberg (18 – 35 minutes). This means that if a student is looking for guidance on a particular area (e.g. exporting a chart as an image file), it is possible to go directly to a video for this area, rather than have to go through a much longer video. As with Bloomberg, they assume no prior knowledge. Thomson ONE.com Investment Banking: Around 40 videos, between one and six minutes in length, for total content time of about 1 ¾ hours. Click on the required option on the certification page (e.g. Datastream) and follow the prompts to view the videos. Questions are based on the content in the videos. Three sample questions are available from the certification page (see above) for each product. There is a single examination for Datastream and Thomson ONE.com Investment Banking. Format is 30 questions, multiple choice, with a pass mark of 80% or more. An examination can be re-taken once only. So a slightly higher mark is needed than with Bloomberg (75%), but with Bloomberg, a minimum of two examinations is required to get a certificate. Time limit: 60 minutes. This certainly focusses the mind and makes undertaking the examination more stressful, compared to Bloomberg, which has no time limit. As with the training videos, the examination can be taken from any location with web access. Click on the product option (e.g. Datastream) and a further option then becomes visible on the left hand menu: Step 2: ‘Ready to take the certification ?’. Once selected, this sends an email with a link within to begin the examination. This is emailed as an image file immediately after successfully completing the examination, which can be printed and/or saved. A 30-minute session covering the steps involved in certification for the database in question. Adapting to the reaction of students in the first training sessions, I added an introductory section in the middle, which covers searching and the type of information/data available within each database. This allows students to get an appreciation of the ‘look and feel’ of the product, rather than just concentrating on the key steps in certification. This definitely improved the training and resulted in a more rounded course and better student attention. Responding to this is a bit of an art … what other commitments and events can reduce demand or result in students who have booked a place not attending? Reading week is to be avoided – most undergraduate students have gone home. Other factors include jobs fairs which are promoted at short notice and end of year examinations (April/May), when demand for certification training is markedly reduced. In the training sessions I suggest a couple of potential approaches to preparing for certification examinations. First, spend a few hours each week building familiarity gradually. And, secondly, waiting until directly after the end of year examinations and putting in a concentrated effort to complete certification – seven days, for example. 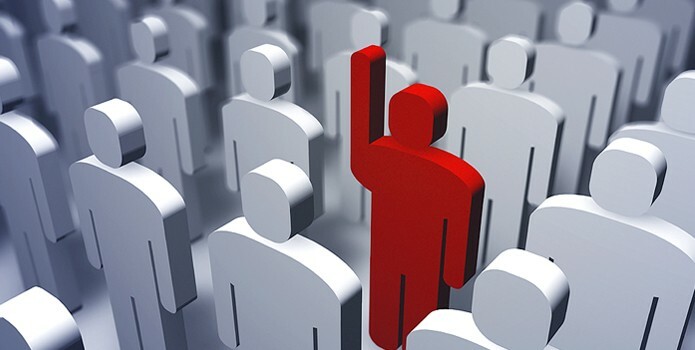 Employability: an additional qualification which can help to set students apart from other candidates – who may otherwise have very similar qualifications. Database overview: certification gives an overview of searching techniques for a database, meaning they can make more effective use of the content available from a database. For example, completing Datastream certification would mean an MSc student on a finance-related course would be fully prepared to search for quantitative data in support of their dissertation. I did this by effectively summarising the certification content. This involved compiling comprehensive notes on areas I felt I needed to memorise (from the videos in Bloomberg) and developing a certification manual (for Datastream and Thomson ONE.com Investment Banking). This gave me familiarity with the content and when completed, a quick reference source to consult. Once the examination(s) were completed, I developed a training course to guide students in the certification process, thus passing on my expertise. Flexible working: I could progress at my own pace, taking into account other work commitments. Hence, the preparation for certification could extend over many months. This is reflected in my certification completion dates: Bloomberg (November 2011), Datastream (February 2013) and Thomson ONE.com Investment Banking (January 2014). By providing certification training to guide students and promote success in the certification process, the library is helping achieve a university goal – to improve the employability of students. The certification training sessions provided within the library have been successful, with continuing demand over a number of years. Edgecliffe-Johnson, A. Bloomberg service in $100m revamp. Financial Times. 27 February 2012, p.1. An updated post is available, posted 16/10/2015. Through the many posts by Mark Greenwood in this Business Research Plus blog, useful solutions to technical problems have been provided – how to gather data from a specialised financial database, for a dissertation, for example. Another way to improve the technical knowledge of students (and librarians) in such endeavours is to undertake Certification in these financial databases. I have successfully undertaken certification for a number of financial databases over the last three years, which has helped me in my role in the Business Data Service. This gave me the authority to be able to stand in front of students in a training session, having gone through the process myself and therefore being in a position to answer any questions relating to certification. Although the certification process for Bloomberg Professional is commonly known as ‘Bloomberg Certification’, the official title is ‘Bloomberg Essentials Training Program’, which appears on the certificate (when the examinations have been successfully completed). Videos are viewed and examinations taken at a Bloomberg terminal. Having to be at a terminal to view the videos and take examinations limits flexibility. This is because it restricts students to the opening hours of the buildings in which the Bloomberg terminals are located. This displays the four core and four market sector videos, which range in length from about 18 to 35 minutes, for total content time of around 3 ½ hours. They assume no prior knowledge and develop a student to a moderate level of competence, covering background, searching, content available and numerous functions. The format is screen shots from Bloomberg, with a text commentary on the right side plus an audio commentary, listened to through headphones (socket at rear of the keyboard) or speakers in the keyboard. Questions are based on the content within the videos. There are no sample examination questions. 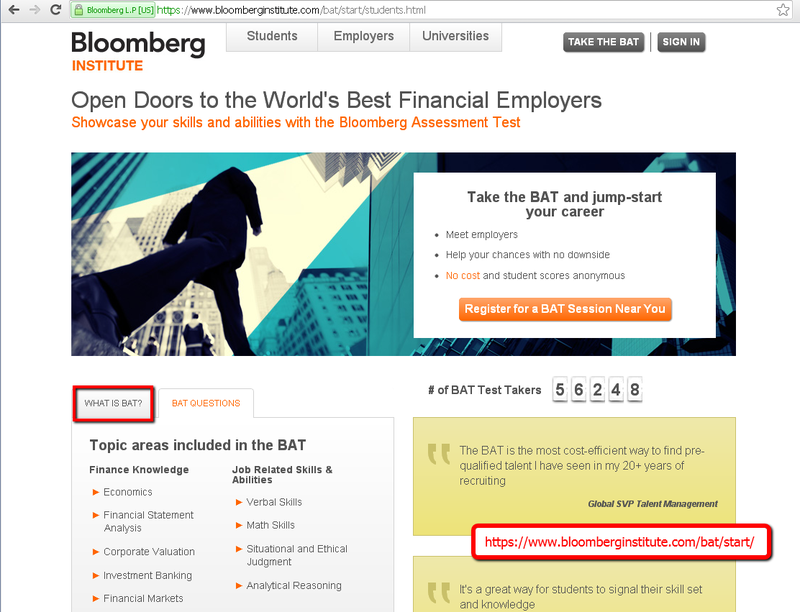 A candidate would need to obtain a Bloomberg Personal Login and use this to log in to Bloomberg prior to taking the examinations. This means the system knows who is taking an examination and their name would appear on the certificate, when examinations have successfully been completed. It takes a minimum of two examinations (Core [30 questions, multiple choice] plus one Market Sector, e.g. Equity Essentials [17 questions, multiple choice]) to qualify for a certificate. As noted in the screen shot above, the pass mark is 75% or better and an examination can be re-taken once only. Students could of course choose to take more than one market sector examination, for which they would receive further certificates and demonstrate a wider grasp of the Bloomberg Professional service. Again, this option is on the BESS page, under the cryptic description of ‘Acknowledgment of Completion’, or to put it more simply: send me my certificate. This is emailed as an image file attachment which can then be printed and/or saved. Your interest in finance and financial markets could start with your university course, your career aspirations, intellectual curiosity, or a combination of all three. Whatever the reason, take one of the specialist financial databases for a quick test drive and get a glimpse of the world from the perspective of a finance professional. Current students, and staff, at the University of Manchester have access to Bloomberg Professional from Bloomberg, Thomson ONE.com from Thomson Reuters, and Capital IQ from Standard & Poor’s. Bloomberg Professional is a great database for getting the professional experience – you just have to think of a large, quoted company, find it and start to browse around. 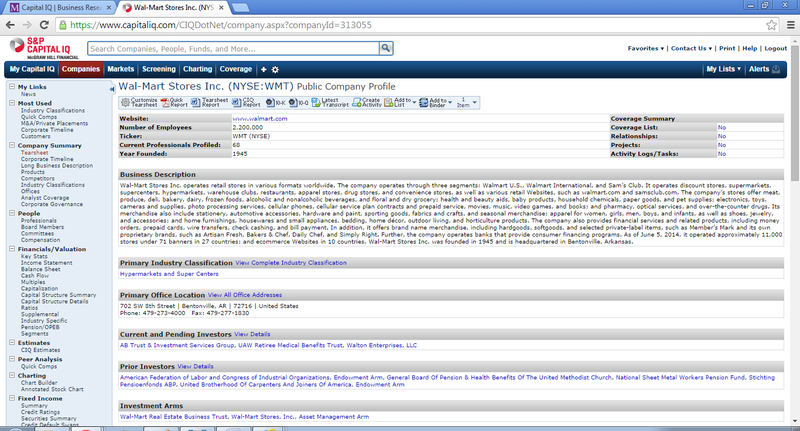 Bloomberg is only available on specific PCs so you have to go to the library. Once you have Bloomberg running, type the company name in the command line, select the auto-matched series, and choose DES (description) for your command. 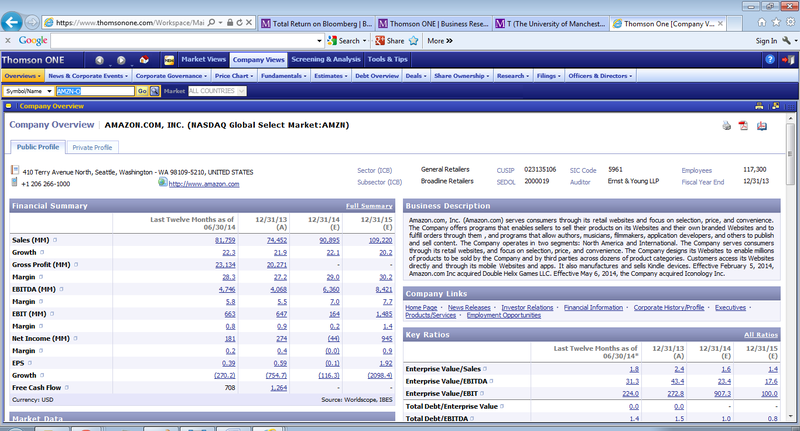 The screenshot below shows the result for Samsung. If you are unsure where to go on your test drive there are various Bloomberg posts that could give you inspiration. Thomson ONE.com from Thomson Reuters is not quite as eye-catching as Bloomberg but it does have a web interface, so you can use it from any PC where you have Internet Explorer as your browser and can run the VPN software to access university resources. Use the search box to find a large, quoted company by name and you get a standard overview report. Explore the different sections of the report and then the different tabs. The following screenshot is for Amazon. There are various Thomson ONE.com posts to give you tips. In addition, you can also use one of our library guides to help get started. 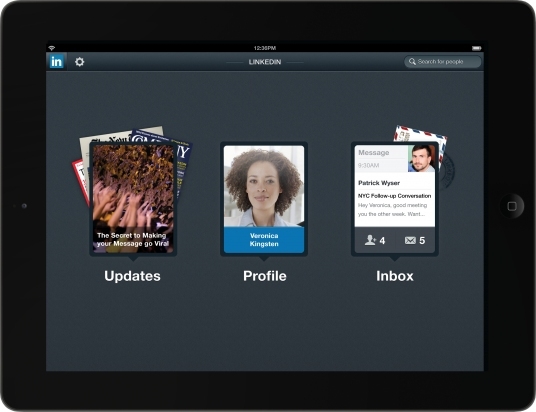 Capital IQ, like Thomson ONE.com, has a web interface – you need VPN and a special username and password. Getting started is the same – search for a large company by name and start with the default overview report. With Capital IQ the large list of options to explore appears as a list of headings on the left. This screenshot is for Wal-Mart Stores (who own the Asda in the UK). When exploring any of these databases it is best to start with a large company as more information will be available, in general large, quoted US companies as the most studied by professionals are the best.